Quesadillas are one of the most accessible and most popular forms of Mexican food. This tasty treat features two tortillas (or one tortilla folded in half) filled with delicious melted cheese and sometimes a mix of vegetables or meats as well. Quesadillas are easy, quick, and can be a healthy snack when filled with the right ingredients! The downside to making a quesadilla can be, well, making it! Investing in the best quesadilla makers can be a revelation when it comes to making the whole process a lot easier. Why Invest In The Best Quesadilla Makers? To make a quesadilla in a frying pan, you need to flip the quesadilla halfway through to ensure that both sides brown evenly and the cheese melts all the way through. With a big quesadilla, however, this can be difficult – especially for kids. Yes, quesadillas are the perfect after-school snack, especially for kids who are beginning to learn to cook by themselves. Quesadilla makers come in two main varieties: dedicated quesadilla makers and multi-purpose appliances. 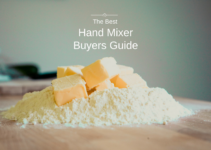 Dedicated quesadilla makers often seal the edges shut to prevent any leakage of cheese or filling ingredients, which can be good for small hands. Because they’re dedicated to quesadillas and just quesadillas, they do that job exceptionally well. Multi-purpose appliances come in a variety of shapes and sizes. Some can make quesadillas as well as a variety of frozen pizzas and other appetizers, while others are more grill-like and would be better for someone who might use it to cook hamburgers or other grilled foods. While this is more similar to a stove than a dedicated quesadilla maker, it also cooks the quesadilla faster than on a stovetop and requires a lot less energy and clean-up. Read on to learn about ten of the best quesadilla makers on the market today. Sized at 8 inches, the Nostalgia EQM600 6-Wedge Electric Quesadilla Maker with Extra Stuffing Latch is perfect for a standard burrito-size tortilla from your local grocery store. 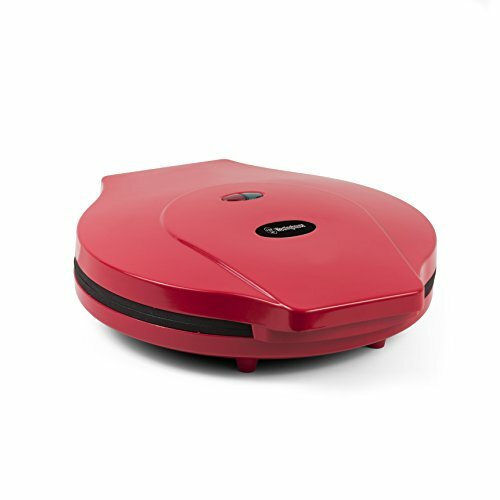 This quesadilla maker comes in a snappy bright red and maintains a small footprint in your kitchen, and can be stored upright. Dedicated to making quesadillas and making them well, the Nostalgia EQM600 6-Wedge Electric Quesadilla Maker with Extra Stuffing Latch comes with a number of features to make your quesadilla taste perfect with minimum effort. The nonstick plates make removing your quesadilla a breeze while still making the tortilla crispy and the cheese perfectly melted. The outer edge of this quesadilla maker seals the tortilla to prevent cheese or other fillings from leaking out. An easy to remove drip tray keeps any drips contained. The nonstick plates are easily wiped clean after use. A bright light tells you when the power is on and when the quesadilla maker is ready, so there’s no guessing if it’s hot enough or if your quesadilla is fully cooked. 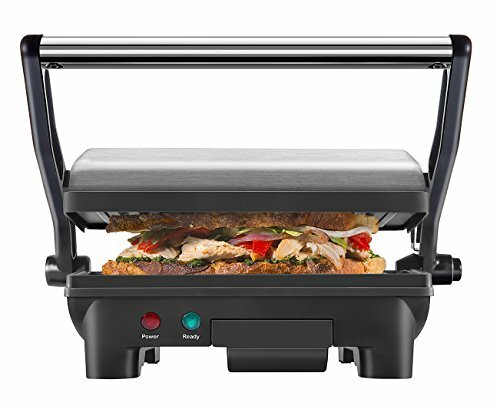 This panini press grill and gourmet sandwich maker from Chefman perfectly toasts any ingredients between any kind of bread – from paninis to gourmet sandwiches to, yes, quesadillas! The two grill plates press down on the quesadilla to grill it from both the top and the bottom, but they can also be opened flat to operate as a traditional grill, if you prefer flipping your quesadilla partway through or want a multi-purpose appliance that works well for cooking burgers and other delicious foods. 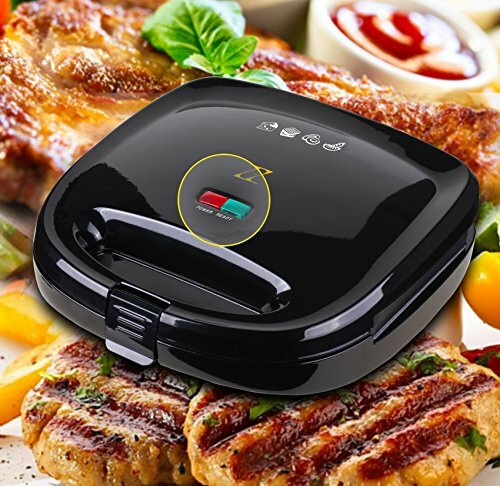 This electric-powered grill and sandwich maker is small enough to travel with, making it a fun choice for making gourmet sandwiches and quesadillas while camping, picnicking, or tailgating. The floating hinge ensures that the top plate presses evenly on the quesadilla, ensuring that it is grilled to perfection. 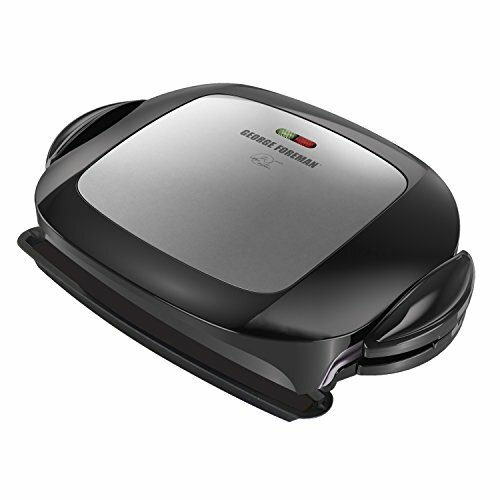 Chefman’s Panini Press Grill and Gourmet Sandwich Maker is ideal for people who want a quesadilla maker that can do double duty as a panini press, grill, and more. This countertop oven is excellent at cooking pizzas, frozen appetizers, quesadillas, and much, much more. Using only a fraction of the energy required by a traditional oven, it’s able to cook food in less time. 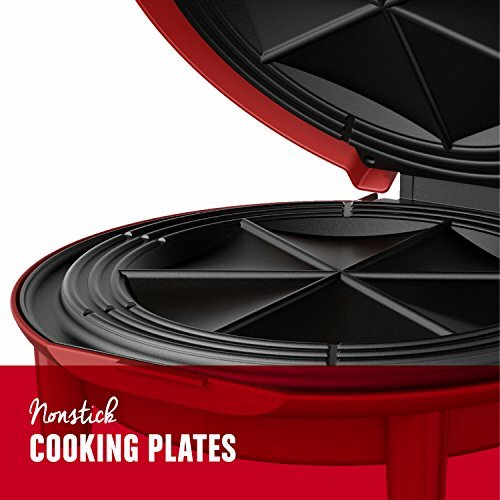 The unique rotating base plate ensures that food is passed under the top heating element in an even fashion, while the bottom heating element passes up heat from the opposite, ensuring that your food is always perfectly cooked in a fraction of the time it would take to even preheat a standard oven. The heating elements are separately controlled, so you can choose to use one or both to cook your quesadilla – and because of the top and bottom heat, you don’t need to flip your quesadilla halfway through cooking. The nonstick surface makes cleaning up a breeze while ensuring a crispy surface and melted cheese to your quesadilla. The removable baking pan is easy to clean and store. This is a great choice for cooks who want the ability to cook quesadillas in a simple fashion, but who are also looking for a quick and easy solution to cooking frozen or take-and-bake pizzas at home. The Hamilton Beach 31700 Pizza Maker is not just a pizza maker – though it does perform that task admirably. 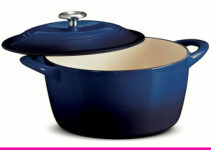 It is an excellent choice for cooks looking for a multi-use cooker. Featuring a nonstick bottom plate and a slightly raised nonstick top plate, this cooker is ideal for making quesadillas, pizzas, and all manner of small hors d’oeuvres. The adjustable temperature control allows you to cook your quesadilla exactly to your satisfaction. Want a super-toasty tortilla? Turn the heat up. Prefer something a little softer, with just a few brown spots and some perfectly melted cheese? Low and slow is the way to go. With the Hamilton Beach 31700 Pizza Maker, you will likely need to flip your quesadilla halfway through to ensure that both sides are evenly browned (due to the raised lid) but for cooks wary of purchasing a single-use appliance, this is a small price to pay for the perfect quesadilla. The viewing window allows you to watch your food as it cooks, ensuring that it never burns, and the interior plates rotate for ideally even cooking. Another multi-use appliance, the Hamilton Beach 3-in-1 MultiGill Grill, Griddle, and Bacon Maker is perfect for chefs who want a quesadilla maker that can multitask, but who are more likely to make burgers than pizza. This electric griddle features a smooth plate and a ridged plate. You can place food onto the ridged plate and press down with the smooth plate above, for items like paninis or even quesadillas, or you can open the two plates flat and have one ridged grill surface and one flat griddle surface. Both surfaces are excellent for cooking quesadillas! The two plates allow immense flexibility: for example, the ability to grill burgers while toasting buns or a vegetable side on the flat griddle. This appliance features 200 square inches of cooking surface, a kickstand to drain grease away, and adjustable temperature control. The grease-draining function makes cooking bacon a breeze – try out a breakfast quesadilla with cheese, scrambled eggs, some crispy bacon and green onions! After you’re done cooking, simply remove the grease tray and both cooking plates and pop them straight in the dishwasher, making cleanup a breeze. 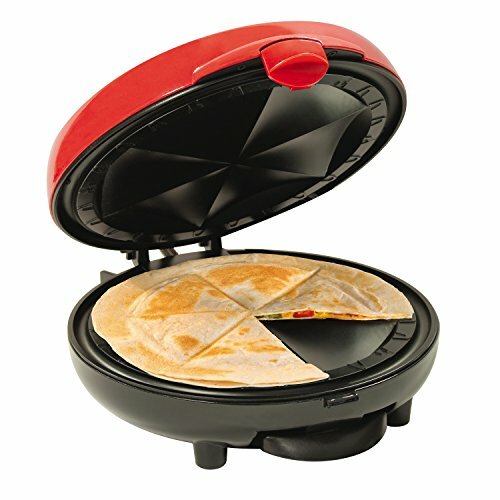 CucinaPro’s Pizza Maker is also an excellent quesadilla maker! The 10-inch diameter fits even extra-large tortillas, and it heats up in just two minutes, making your tortilla faster than the stove would. The nonstick cooking surface makes removing the quesadilla snap and it’s simple to wipe up any filling that might slide out. Not only does CucinaPro’s Pizza Maker work perfectly for both pizzas and quesadillas, it’s also a pro at a number of other popular foods – it will bake cookies, cinnamon rolls, chicken, grilled sandwiches, appetizers, and more in a fraction of the time that the oven would take. In hot weather, the CucinaPro Pizza Maker will keep your kitchen cool as you do not have to preheat a large oven. Food is cooked evenly and thoroughly and you’ll see optimal browning and a crispy crust on the quesadillas you make in this multi-purpose appliance. 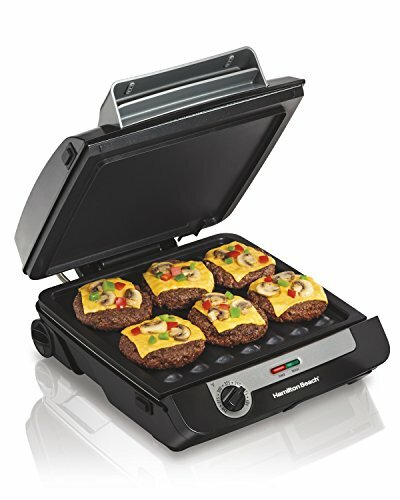 The classic George Foreman grill is updated, making it perfect for all sorts of sandwiches. A whopping 72-inches of grilling spaces means that you can make even jumbo quesadillas on this multi-purpose grill. Two plates press down and evenly grill your quesadilla while the trademark slanted surface will sweep away any grease that leaks out of the tortillas. The drip tray is fully dishwasher safe, so you can just pop it in right away. With a premium ceramic nonstick coating, the George Foreman 5-Serving Removable Plate Grill and Panini Press is a snap to keep clean. Food will not stick, and it’s easy to wipe clean afterwards. The plates are also fully removable and dishwasher safe – much easier than a pan on the stove! The nonstick coating is durable, stain-resistant, and free of chemicals PTFE and PFOA. 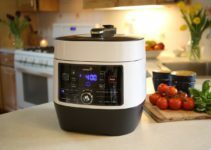 From ZZ comes this multi-cooker which can handle a truly spectacular range of popular foods. Four distinct sets of detachable heating plates are easily interchangeable and perfectly non-stick. The flat griddle is perfect for quesadillas, and the set also includes ridged grill plates, Belgian waffle plates, and plates with triangular pockets for grilled sandwiches. Top and bottom heat ensure that your quesadilla will cook quickly and brown evenly on both sides without the need to flip it partway through. Power-on and pre-heat lights alert you to the stage and temperature of the appliance, ensuring that your food is always cooked at the correct temperature. This electric quesadilla maker can be stored vertically for ease of access and features a cord wrap to keep it neat and tidy. Each of the plates is dishwasher safe for easy clean-up. This takes third place on the list because it is just so versatile – from breakfast food to dinner, this machine does it all. 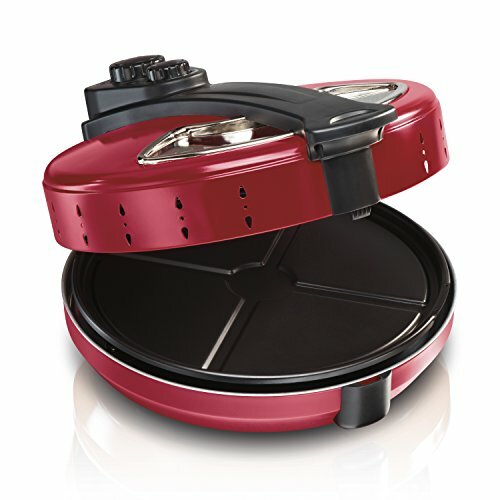 This quesadilla maker from well-known brand George Foreman comes in a snappy red color. Sized for 10-inch quesadillas, this is perfectly sized for standard tortillas. The nonstick cooking surface makes removing the completed quesadilla a breeze while still ensuring that the outer tortilla gets nice and crispy. This electric quesadilla maker features six deep-dish pockets, making it easy to fill the quesadilla with your favorite ingredients and leave no mess behind, as the quesadilla maker seals the outer edge of the tortilla to prevent any ingredients from falling out. In the occasion that there is any fallout, the nonstick cooking surface wipes clean after every use. The six deep-dish pockets also provide guide lines for cutting your quesadilla, making it easy to ensure evenly sized slices. 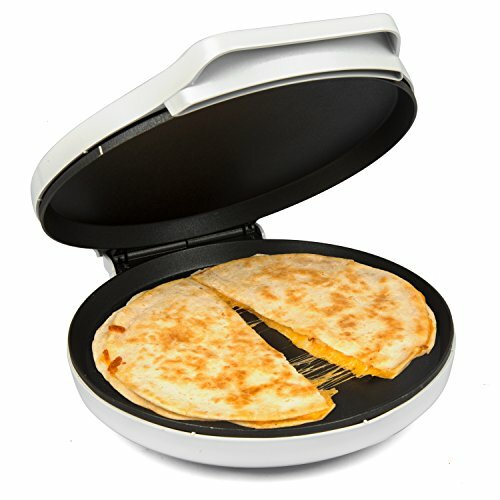 This George Foreman quesadilla maker can be stored vertically or horizontally and features an integrated cord wrap to keep everything neat. This is an ideal quesadilla maker for cooks who want to make large quesadillas filled with delicious ingredients without any hassle. From Westinghouse comes this multi pizza maker: a countertop appliance that excels at cooking not only pizzas but a number of tasty comfort food staples. It’s for this reason that it takes the number one spot on the list: not only is it an extremely highly rated quesadilla maker, it’s also so multi-use that you’ll wonder how you ever lived without one. 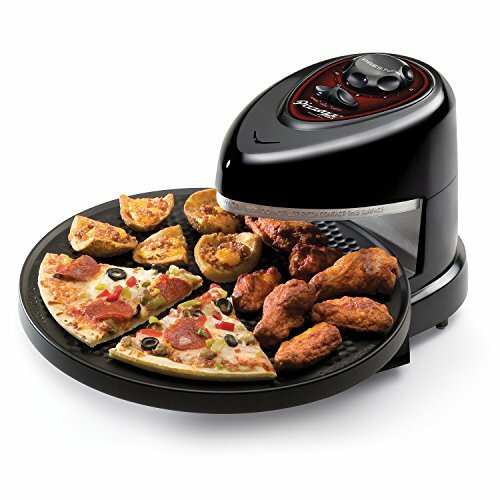 The Westinghouse Countertop Multi Pizza Maker features a flat griddle on the bottom and another heated surface on top. The top heated surface is raised slightly off of the bottom, to provide room for whatever item you want to cook. It can fit up to a 12-inch pizza inside, so standard sizes of quesadillas will fit in here; if you fold the tortillas in half, rather than using two tortillas, you can even cook two quesadillas at once! Featuring a non-stick cooking surface that easily wipes clean after use, this quesadilla maker is perfect for cooks who want an easy way to make quesadillas but don’t love the idea of buying a single-use appliance. The Westinghouse Countertop Multi Pizza Maker can cook pizzas, quesadillas, nachos, cinnamon rolls, pancakes, mini frittatas, croissaints, giant cookies, hors d’oeuvres – the sky’s the limit!